ACMA president Dr. Bob Xu has received rigorous training in science and medicine. He is committed himself to promoting public health and overcoming cancer. He is the author of Chinese Herbal Medicine and Formulation for the Textbook of Complementary and Alternative Medicine, the author of Clinical Handbook of Chinese Medicine, the author of Recommendation on Chinese Medicine in the United States of America (2001) to the White House Commission on Complementary and Alternative Medicine Policy, the author of Letter to the Congress: On Ephedra Event (2002), which elucidated the ephedra event in details and protected Chinese medicine in the United States, and author of many articles on Chinese medicine. He was invited to give presentation or as a speaker at University of Chicago, US-China Peoples Friendship Association, Integrate Conference, American Liver Foundation, Phi Tau Phi Scholastic Honor Society, University of Illinois at Chicago, Holistic Health Symposium, etc. He served on advisory board at University of Chicago Pritzker School of Medicine Tang Center for Herbal Medicine Research, participated in writing medical books for medical students, doctors, and healthcare professionals, reviewed manuscripts submitted to American Journal of Chinese Medicine, etc. In clinical practice, Dr. Bob draws upon many years of clinical experiences to provide a dedicated, compassionate, and comprehensive care to his patients. He specializes in oncology, internal medicine, immunology, and many other specialties. He has saved many patients’ lives who were diagnosed with fatal diseases such as brain tumor, colon cancer, leukemia, liver cancer, ALS, AIDS, heart failure, and so on. Dr. Bob obtained a B.S. degree from Fudan University, attended the Graduate School of Fudan University, was admitted into University of Oxford toward a Ph.D. degree, obtained a M.S. degree and enrolled into a Ph.D. program at Indiana University School of Medicine, got top MCAT at Harvard Medical School, and received a Chinese medical doctor (CMD) degree with honor from the China Ministry of Education National CMD Program. 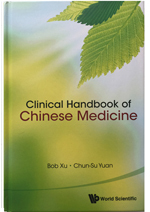 Dr. Bob Xu is the author of Clinical Handbook of Chinese Medicine, the first clinical handbook in this field in English. The book is available at Amazon. This is a concise handbook providing a quick clinical reference on Chinese medicinal treatments for many diseases, based on traditional Chinese medicine theory and practice. Organized by different clinical conditions and diseases, it provides clinicians and healthcare professionals with definitions and recommended treatment methods, especially herbal medicine formulae. In addition to being a comprehensive quick reference source, this handbook also conveys a generalized understanding of Traditional Chinese Medicine. In 2001, Dr. Bob Xu was invited to write the Recommendation on Chinese Medicine in the United States of America to the White House Commission on Complementary and Alternative Medicine Policy. For more details on the recommendation, please click Recommendation on Chinese Medicine in the United States of America. Copyright © 2018 American Chinese Medicine Association (ACMA). All Rights Reserved.